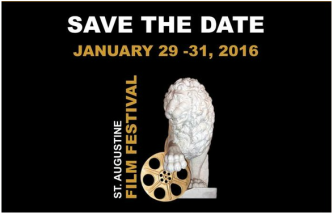 ﻿Published by Sareth Ney on Jan. 21, 2016 at 10:49 a.m.
SAINT AUGUSTINE, Fla. – The Saint Augustine Film Festival will take place at Flagler College and The Corazón Cinema and Café, from Jan. 29 through Jan 31. The films will be screened at Lewis Auditorium, Gamache-Koger Theater, Corazón #1, Corazón #2 and Corazón #3. 22 countries and six continents will be represented. Films screening at St. Augustine Film Festival include: “3 Days In Havana”, “3rd Street Blackout”, “American Graffiti”, “The Anthropologist”, “Apples From The Desert”, “Back In Time”, “A Ballerina’s Tale”, “Battle For The Barriers”, “Boccaccerías Habaneras”, “Cásese Quien Pueda”, “Cassanova Was A Woman”, “Chau, Beyond The Lines”, “Chosen”, “Haemoo”, “Le Père Noël”, “The Liberators: Why We Fought”, “Look Again”, “Look Below The Surface, “Lost & Found”, “The Morning After”, “Never The Same: The Prisoner of War Experience”, “Nos Femmes”, “The Penguin Counters Who Knewl”, “The Race”, “Requiem For A Man Who Wanted Too Much”, “Snarky Puppy”, “Silver Skies”, “The Secret of Italia”, “Theeb”, “Time Simply Passes”, “Tokyo Fiancèe”, “Treblinka’s Last Witness’”, “A Tree Without Roots”, “Unmappable”, “When Voices Meet” and “The Wonders”. Flagler College student films being screened are: “Drain”, “Emily”, “Just Married”, “Lost”, “Nobody Fights Alone”, “Satisfaction at Echospring”, “Who Drank All the Wine”, “St. Augustine's Michael Jordan”, “Success is the Best Revenge” and “Wild Woman”. The screening will take place at Gamache-Koger Theater, on Jan. 29. It is free and will begin at 6 p.m.
Sponsors include: Ali Harmon, Allia & Associates, Ameris Bank, Anastasia Law, Arnold and Barbara Grevior, Casa Monica Hotel, Catering Culinary Outfitters, Catherine Duncan Architects, Centro Restaurant & Piano Bar, Coggin Honda St. Augustine, Cottrell Painting & Handyman, Inc., Culture Builds Florida, Datil Duo Band, Entire Inc., firstcoast.tv, Flagler College, Fort Lauderdale International Film Festival, Funkytown Fitness, Greater Fort Lauderdale, Hilton St. Augustine Historic Bayfront, Island Family Pharmacy, JetBlue, Kenneth & Shirley Walker, Lightner Museum, Mario Della Penta, Mark and Kathy Edwards, Mermaid Life, Radiology Associates Imaging, St. Augustine, St. Augustine Ballet, St. Augustine Magazine, St. Augustine Social, St. Augustine Woman’s Journal, St. Johns County Tourist Development Council, St. Johns Illuminations, Stella Artois, The Corazón Cinema and Café, The Edwards Partnership, The Fort Lauderdale International Film Festival, The Freenotes, The Golden Way, The Sea Turtle Hospital at Whitney Laboratory, Totally St. Augustine, WFCF 88.5 Flagler College Radio and Wise Design. To visit Saint Augustine Film Festival’s website, please click here. To like them on Facebook, click here. To follow them on Twitter, click here.